The greatest joy of portrait photography is the creativity that happens when you match a person and their character with the light, the setting, the expression, and the gesture. This creative moment came together especially well with Jack’s senior portrait. 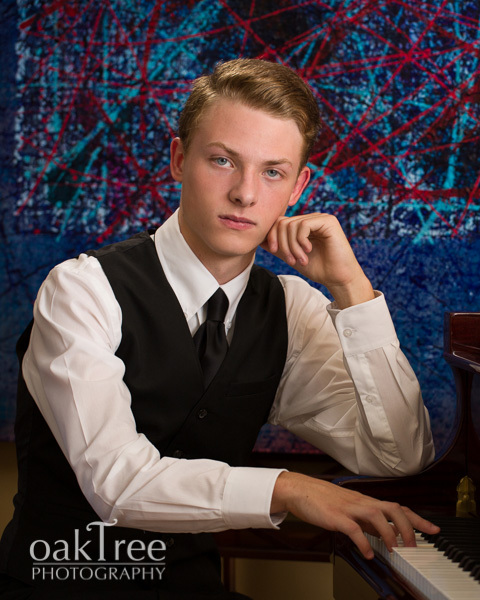 Jack loves music and is an accomplished pianist. Not having a grand piano in my studio, I arranged with a friend to use their home with its Kohler & Campbell. Positioning the piano near a floor to ceiling window, I placed a white scrim over the window to soften the light. A beautiful painting by a local artist, in a style reminiscent of Jackson Pollock, was moved from another wall and placed behind Jack. Then I had Jack place his hands, relax and breathe, then look directly into the lens. The result is this portrait. You can judge its effectiveness for yourself. Jack and his family loved it—they could see his confidence, his poise, and the profound love he has for music. This portrait will stand the test of time, because it shows the music within!